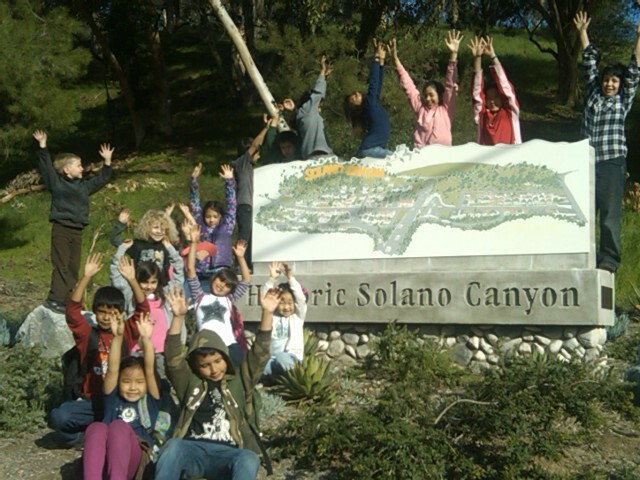 "Solano Canyon is set on the rolling hills of Elysian Park, with broad vistas of downtown Los Angeles. This historic community is the last remaining neighborhood that bordered the Chavez Ravine neighborhoods of La Loma, Palo Verde, and Bishop. Although divided by a ridge, Solano Canyon residents considered the Ravine residents to be their neighbors and friends, and many were distraught when the community was torn down in the late 1950s. Today the ridge is gone, swept away by bulldozers to clear a road to Dodger Stadium; but the Solano Canyon community remains as one of the last great neighborhoods of Los Angeles." "The community boasts a top-notch elementary school, its own Mission Church, and a community garden. It is home both to long-time and new residents that include artists, city workers, musicians, teachers, filmmakers, professionals, and writers. The community’s neighbors include the Los Angeles Dodgers, the Los Angeles Police Academy, historic Chinatown, and Echo Park. Editor's note: Hudson-Harvey's charming, not-entirely-accurate description of Solano Canyon confuses several important points. Solano Canyon was the first community in the Stone Quarry Hills, founded in 1866 by Francisco Solano and his wife, Rosa Casanova; the Chavez Ravine communities of la Loma, Palo Verde, and Bishop arose during the early decades of the 20th-Century, primarily between 1920 and 1940. Solano Canyon residents were not divided by a ridge from Chavez Ravine; rather, the la Loma community was a natural extension of Solano Canyon that flowed organically and continuously up the loma from Amador Street in Solano Canyon. Most of the homes in Chavez Ravine were gone by 1952, not the late 1950s, as evidenced by an aerial photograph taken that year. And the loma is only partially gone; the earthmoving equipment that reduced it constructed a road that became the Solano Gate to Dodger Stadium. On that portion of the loma that remains, several of the streets — notably portions of Brooks Avenue, Bouett Street, Spruce Street, Agua Pura Drive, and even traces of Phoenix Street and Jarvis Street — remain, and may be seen to this day. All students know the school motto. It emphasizes a belief in effort based learning, and sends a positive message that every child is capable of success. Through hard work and tenacity goals are achieved. Solano Avenue School is a small school of approximately 260 students (pre-school through grade six) nestled in a close-knit community between Dodger Stadium and Chinatown. 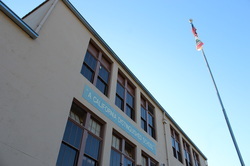 We have earned the distinction of being named a California Distinguished School in 1996, 2000, and 2006. We have also been awarded Title I Academic Achievement School three years in a row. In 2009 Solano earned the distinction of being named a Blue Ribbon School. This is largely because of our qualified staff, rigorous academic program, and high degree of collaboration. We are a stable, diverse learning community dedicated to delivering an educational program of academic excellence to all students. San Conrado Mission, at 1820 Bouett Street, is located at the corner intersection of Bouett and Amador Streets. A Claretian missionary, Father Tomas Matin, built Mission San Conrado in 1966. Over the nine succeeding years, and culminating in his death, Father Matin built a reputation as a holy man among his parishioners. Father Matin was perhaps the last priest in Los Angeles to wear the biretta and cassock on a daily basis. At present, San Conrado is a mission of St. Peter's Italian Catholic Church on North Broadway. In place of coffee and doughnuts, the congregation and neighbors may proceed downstairs to the social hall for a Mexican brunch of menudo, tacos, burritos, coffee and pan dulce. The kitchen at San Conrado is open to all. One can visit the social hall downstairs and buy a delicious brunch item on Sundays. Plan to visit before or after Mass if you would like to support our Church. Our recommendation: the crispy tacos! Spanish Mariachi Mass is Sundays 10:30–11:30 AM . The Solano Canyon Community Garden occupies the former site of the Solano Avenue Elementary School, which was torn down in 1935 shortly after construction of the Pasadena Freeway. The freeway runs along side—and under—the garden. Part of the orchard is actually situated above the second tunnel of the northbound lane of the 101. Community residents helped to establish this garden eight years ago. You'd think it had been there far longer. In addition to well-tended beds of vegetables and flowers, lively mosaics accent the common areas in walls, tables, sidewalks, and shaded benches. The mosaics are the work ofa local artist and gardener. Solano Canyon Garden is almost five acres in size. Two thirds of the space is devoted to an orchard and hillside planting beds for non local farmers. The remainder consists of common areas and 30 individual garden plots.